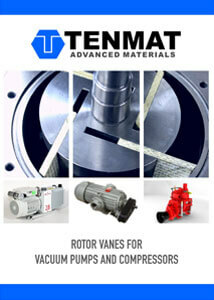 TENMAT advanced materials are used extensively in rotary vane vacuum pumps and compressors throughout the world. TENMAT high quality rotor blades are available in different grades and customized sizes according to customer specific applications and environmental conditions. 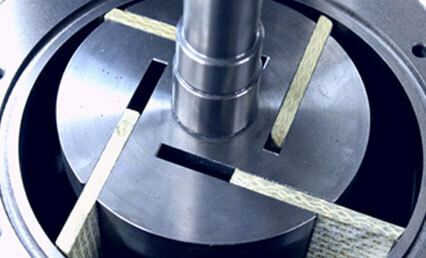 FEROFORM AE2 and FEROFORM F57 are the materials of choice for all major milking pump manufacturers around the world. TENMAT rotor vanes are readily available in standard dimensions and can be manufactured according to customer specifications with lengths up to 1800mm. FEROFORM F57 rotor vanes are the industry standard for high temperature (in excess of 200°C), heavy duty applications. TENMAT rotor vanes combine outstanding wear resistance with excellent dimensional stability. Due to their exceptional chemical resistance, TENMAT rotor vanes are the ideal solution for ammonia boosters and compressors within the refrigeration industry. Additional application for long lasting TENMAT rotary blades are tanker discharge pumps, pneumatic transfer air compressors and fracking equipment. FEROFORM F43 rotor vanes were specifically developed for pumps with forced oil lubrication. The principal areas of use are in single and two-stage high vacuum pumps where FEROFORM F43 exhibits superb stability under vacuum, insensitivity to moisture, excellent strength retention, and low noise. Due to its unique microstructure, FEROFORM F43 can be machined to tight tolerances and extremely smooth surface finishes. Typical applications include rotary vane pumps on analytical instruments and mass spectrometry. TENMAT’s FEROFORM F200A resin bonded graphite vanes provide outstanding service in demanding applications such as dry running vacuum pumps. TENMAT’s specialty graphite blades are commonly used in environments where oil lubricated pumps are not an option, such as hospitals, laboratories and in the food processing, as well as vacuum forming industry. Long life and reliable performance are hallmarks of this quality product.